There’s only one thing runners like to do more than run. That’s talk about running but unfortunately our vocal cords occasionally need a break. 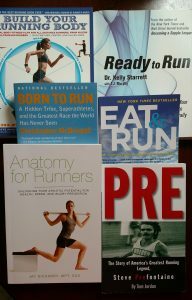 At that time, break out this reading list featuring some of Team ECRP‘s favorite, and most useful, running related books. Pre (Jordan) – The story of America’s most fabled tracklete, Pre is a biography of Steve Prefontaine. Well crafted and uncomplicated this exciting tale lends itself to page turning. While also providing a bit of education on the history of track and field, this short novel should be on every runner’s shelf. Eat & Run (Jurek) – This chronicle of Scott Jurek’s ‘unlikely journey’ to ultramarathon greatness is peppered with lots of smiles and tasty recipes. With a main focus on how nutrition effects performance, Eat & Run is a great resource for vegetarian and vegan athletes. Even for meat eaters these recipes are worth a try. Anatomy for Runners (Dicharry) – Get ready to learn. Chock full of knowledge, Jay Dicharry’s guide will lead you to happier and healthier running. Doesn’t the subtitle ‘Unlocking Your Potential for Health, Speed and Injury Prevention’ sound enticing? Anatomy features exercises and explanations that are easy to understand and process. A must read for runners serious about improving. Born to Run (McDougall) – This massive best seller should definitely be on your reading list. Even if you’ve already covered it, consider cracking it open again. This epic tale of one runner’s desire to end foot pain started the minimalist movement. No matter how you feel about zero drop shoes, the story of Mexico’s Tarahumara will inspire you and that next marathon registration. Ready to Run (Starrett) – ‘Unlocking your potential to run naturally’ is Dr. Kelly Starrett’s goal with this big book. So get ready. This guide will teach you more about movement that you likely care to know but it’s 100% worth it. The founder of MobilityWOD.com has worked with professional athletes from all fields of play and wants you to become a stronger, more efficient runner. Build Your Running Body (MacGill/Swartz/Breyer) – Bob Anderson, the founder of Runner’s World, calls this the ‘best running book ever’ and there’s no arguing with that. Yes, it’s full of physiology and science however it’s easy to understand and digest. Following the guidelines in this book will help you run faster, reduce injury risk and have more fun. This entry was posted in Nutrition, Racing, Recipes, Running, Strength Training and tagged mobility, racing, running, running books, strength training on July 24, 2017 by Coach Meredith. 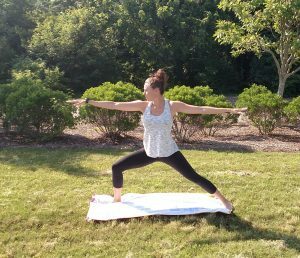 Yoga is an excellent tool for runners to have in their fitness toolbox. While they don’t need tons of static flexibility, which can actually take power away from you, it is important to have strength through a full range of motion at all joints, especially the hips. Spending a few minutes each day going through some or all five of these yoga poses will also help relieve muscle soreness and provide relaxation. 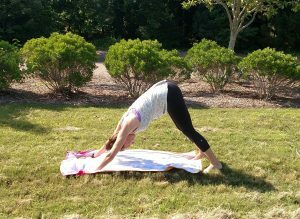 An easy pose to do just about anywhere, down dog is an excellent way to wrap up a workout. It stretches your arms, hamstrings, glutes, shoulders, calves and feet. Hang out like your pup for up to three minutes taking deep breaths to build arm and leg strength while reaping the pose’s calming effects. This standing pose will help you open those post run hips. With feet 3.5-4 feet apart and your back foot turned out, reach from your shoulders with arms parallel to the ground. Sink down until your front thigh is also parallel to the ground while your torso stays tall over your hips. Perform on both sides to get all of the leg, hip, groin and ankle stretching and strengthening benefits. Of all the yoga poses, this one is one of the most simple. Great for stabilizing your core, make sure you’re hips stay high and your shoulders are directly over your wrists or elbow when performing it. 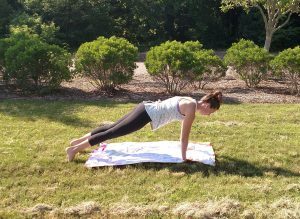 Use this simplest plank to improve your running posture while strengthening your shoulders, arms and wrists. This hip opener is perfect for both before and after your run. After stepping back with one leg be sure to keep your front shin vertical as you reach both hands to the ground on the inside of the front knee. You’ll feel it stretch your hips, thighs and chest as you repeat it on both side. You get a little help on this one. Raising your legs vertically above your head while keeping your sit bones in contact with the ground might be the perfect pose. It has health benefits as well as stretching ones. It doesn’t matter how close you are to the wall in the beginning. Tighter runners will need to be further away to keep their lower back supported. You’ll move closer and your flexibility increases. Add these yoga poses to your pre- and post-run routines to prevent soreness, relax and improve mobility. This entry was posted in Injury, Running, Strength Training and tagged flexibility, marathon training, mobility, recovery, running, strength training, yoga, yoga for runners on June 5, 2017 by Coach Meredith. Injuries happen all the time. Athletes of all levels and even those who aren’t athletes can experience an injury. Recovery can be as simple as a little ice or heat and elevation. It can also be as complicated as surgery and take months. The key to recovering is understanding your injury and preventing it from happening again. Were you tackled in a football game? That’s easy to source. Do you have daily low back pain and discomfort? Maybe your hamstrings are tight, maybe it’s something else. Are you having knee pain because you’re heel striking while you run? Are your knees falling in when you squat under weight? Lots of day to day and chronic injuries are not so easy to pin down but discovering what caused the problem is the best possible thing you can do to move forward. Are my movement patterns correct? Do I have adequate mobility to perform these movements safely? Am I using the correct equipment? Do I take care of my body before and after a workout properly? If you can’t answer these questions or answer them satisfactorily, get help from a trainer, doctor or teacher who will guide you in the right direction. Stripping your activity down to the bare minimum will highlight the root of what caused your injury and help you avoid it in the future. This entry was posted in Durability - Toughness, Running, Strength Training and tagged injuries, injury prevention, mobility, running, strength training on September 26, 2016 by Coach Meredith.